The Super Bowl is a cultural phenomenon unique to the United States. Super Bowl 51 is expected to continue the trend of spending, eating and celebrating this sport that is uniquely American. 111.9 million viewers will tune in to watch the big game and ratings agencies say that 46% of viewers will be watching the game. Whether you plan on attending Super Bowl parties or staying home to watch the game, there are a lot of numbers outside of those on the football field that may surprise you. The average person hosting a super bowl party in the US this year will spend around $118 to host that party. 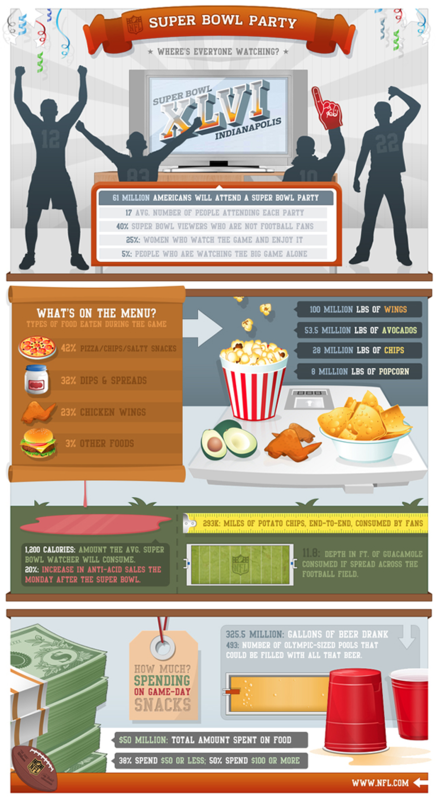 In fact, the Super Bowl Sunday is the second biggest day of the year behind Thanksgiving for food consumption. That is slightly less than Houston, the Super Bowl host city plans to spend to prepare for the Super Bowl. They plan on spending around $5.5 million to prepare and anticipate Super Bowl related economic impact to be somewhere around $500 million. The Super Bowl is not always a positive for host cities as past Super Bowl hosts have lost money on the event although full numbers are hard to pin down exactly. Americans will see an estimated Super Bowl related consumer spending of $12.37 billion. That is a huge amount of money. For those of you who are gamblers, you are not alone during the Super Bowl. It is estimated that $132.55 million will be wagered on the Super Bowl in Nevada alone. Don’t forget the beer! With all of those people tuning in, this is the Super Bowl for commercials as well. At Super Bowl parties I have attended, it seems that half of the crowd is there for the football and the other half is there for the commercials and the halftime show. Many businesses see this as the holy grail of advertising as you can see by the graphic above. 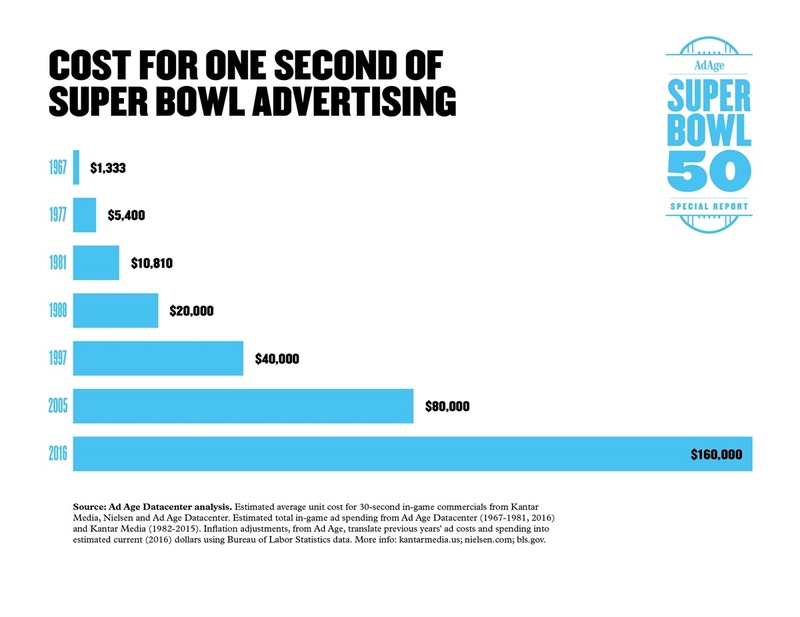 This is the cost of 1 second of commercial time during the Super Bowl over the years. That is quite a bit to spend for a second of air time and apparently quite a few companies feel that it is money well spent. When it comes to your money and the stock market, there is an odd statistic that holds true 80% of the time. 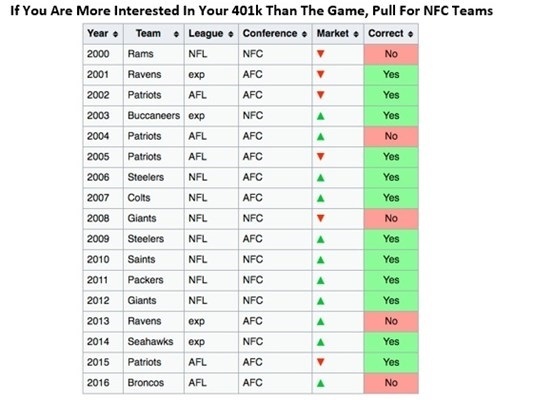 In the past, an NFC win means the stock market measured by the S&P index will be up for the year and an AFC win means the stock market will be down. There is no reasonable explanation for this, it is just an odd reason to pull for the Falcons or the Packers and against the Patriots and the Steelers. Nobody likes the Patriots anyway, right?